other name:- Auld Grey Town, The ? Road strip maps with parts in Westmorland, Cumberland etc, now Cumbria, irregular scale about 1.5 miles to 1 inch, by E J Burrow and Co, Cheltenham, Gloucestershire, 1920s. ... The gateway to the Lake District from the south is Kendal, marked as we approach it by the ruins of Kendal Castle crowning a hill to the right. Kendal is an interesting old town with memories of Border warfare. Of its ancient houses the most curious is one in Wildman Street called the 'Castle Dairy.' This is typical of what most houses in Kendal were formerly like - built with an eye on the need for defence. Its walls are of great thickness and the house is provided with hiding places. The church is notable chiefly for its monuments, including one to a seventeenth-century vicar with a quaint rhyming inscription. Description of Scenery in the Lake District, by William Ford, published by Charles Thurnham, London, et al, 1839; published 1839-52. THE order in which the Lakes should be visited, if seen in any prescribed order at all, can be pointed out much more easily than satisfactorily. Lancaster and Kendal in the south, Carlisle and Penrith in the north, formerly offered the readiest facilities of access to this Northern Elysium; but since the improvement of steam navigation, Whitehaven and other ports have become equally suitable as starting places. One advantage, however, remains in favour of the old routes, that the direct lines are better, especially for carriages, although to the pedestrian this will not be a matter of any great importance. consisting of a mayor, recorder, alderman, and capital burgesses. By the recent Municipal act, it is divided into three wards, under the superintendence of a mayor, six aldermen, and eighteen councilmen. By the Reform bill, the town returns one member to Parliament. It was formerly noted for coarse woollen goods, called Kendal cottons, but goods of finer description are now more commonly manufactured. The river Kent affords plenty of water for its numerous mills and dye-houses. There are also very extensive marble works. As the country people for many miles around attend the markets and fairs, the town thus combines the character of a manufacturing place, with that of the centre of a rich agricultural district. 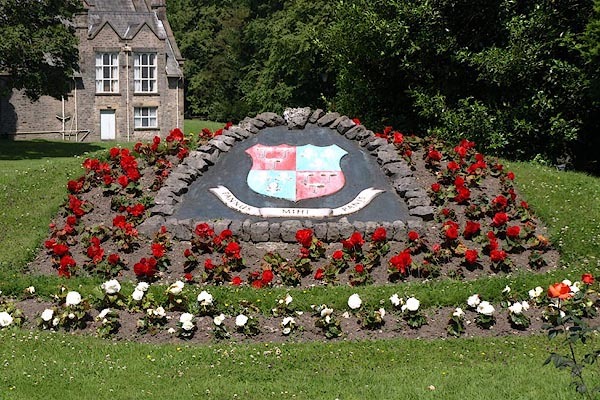 Kendal can also boast of being furnished with schools and charitable institutions, as numerously and liberally endowed as any town of equal population. Indeed, in this respect, the county of Westmorland exceeds all others, owing chiefly to the number of clever and eminent men who have distinguished themselves, and have sought to return back to their native county some portion of those benefits which they themselves derived from it. 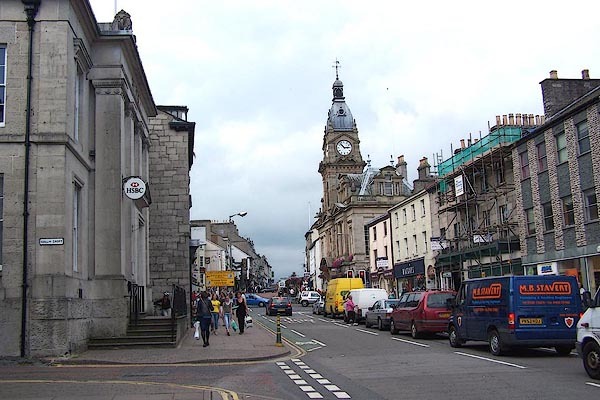 KENDAL is a flourishing town, being the largest in Westmorland, and is placed in a very agreeable valley, enlivened by the meanderings of the Kent. A full description of it will be found at page 19. Guidebook, Concise Description of the English Lakes, later A Description of the English Lakes, by Jonathan Otley, published by the author, Keswick, Cumberland, by J Richardson, London, and by Arthur Foster, Kirky Lonsdale, Cumbria, 1823 onwards. Is a clean and well built town, of considerable trade, and a population of 11,301 inhabitants. It is situate at the junction of the Carlisle road by Penrith, with the Whitehaven road by Ambleside, Keswick, and Cockermouth. It is famous for the manufacture of various kinds of woollen goods and fancy waistcoats. Here is a manufactory of ivory combs; and a marble manufactory, where several varieties of the limestone of the country are worked and polished. The King's Arms and Commercial are the principal Inns. The mean annual quantity of rain at Keswick is about 68 inches; at Kendal 60 inches; at Manchester 35 inches; at London 20 inches. Map, Westmoreland ie Westmorland, now Cumbria, scale about 19 miles to 1 inch, by James Wallis, 77 Berwick Street, Soho, London, 1810; published 1810-36. PRINCIPAL INNS, RECOMMENDED TO TRAVELLERS AND FAMILIES. Kendal: Crown, King's Arms, White Hart, besides several others, where travellers will be well accommodated, at low charges. Kendal: April 27, horned cattle, sheep, and pedlary; Nov. 8, horned cattle, horses, and sheep. Perspective road map with sections in Lancashire, Westmorland, and Cumberland through Kendal and Penrith ending at Carlisle, by J Baker, London 1802. At the approach to Kendal, where I made my sketch for the plan of that town - It deceitfully appears to be situated in a secure valley, contiguous to which, on a hill to the right, are the ruins of the castle. Another similar eminence, ornamented with an obelisk, is called Castlebow Hill. From either of these may be obtained the most complete view of the adjacent river Kent, and surrounding country, and as many deep valleys are comprehended in this prospect, the apparent situation of the town, by a comparison with them, rises to a greater eminence. It is very ancient, and still retains several British and Roman remains. Here were early planted some of our most productive manufactories, particularly those of woollen cloths, cottons, and stockings, which have since branched so widely and profitably to other pasrt of the kingdom. Queen Elizabeth erected the town into a corporation; and Charles the First confirmed and enlarged the charter. It hath a mayor, 12 aldermen, and 20 capital burgesses. It is recorded by a Latin inscription on the wall of the vestry in the church at Penrith, that 2500 people died here in 1598, of the plague. The market, inns, and principal shops of trade are on the highest ground, near half a mile from the entrance of the town; from thence to the north is another street of nearly the same length; another leads by similar distance to cross the river Kent on the eastward, and by means of this latter the post road is continued to Shap. Kendal - King's Arms / At Kendal, on r. T.Rs. to Sedbergh, Kirkby Stephen, and Appleby; on l. to Milthorpe, Ulverston, Winander Mere, and Ambleside. INNS. Kendal, Crown, King's Arms, W. Hart. INNS. ... Kendal, Crown, King's Arms, W. Hart. Britannia, or A Chorographical Description of the Flourishing Kingdoms of England, Scotland, and Ireland, by William Camden, 1586, translated from the 1607 Latin edition by Richard Gough, published London, 1789. ... All these bodies of water [lakes] abound with divers species of fish, as trout, eels, bass, perch, tench, roach, pike, char and divers others. The south coast is pretty well furnished with sea-fish, of which upwards of thirty different sorts have been brought to Kendal market, till by the improvement of the town and port of Lancaster the market for fish is considerably drawn that way. "In Westmorland is but one good market town called Kendale, otherwise, as I wene, Kirkby Kendale. It hath the name of the river called Kent, unde & Kendale, sed emporium laneis pannis celeberrimum. In the town is but one church: the circuit of the parish by the country adjacent hath many chapels and divers in the town itself. ..."
Charles Stuart 3d son of James duke of York after king James II. was created duke of Kendal 1664. Prince George of Denmark was created duke of Cumberland and earl of Kendal; and Melusina Erengart Schulenburg, who had before been created duchess of Munster in Ireland, was further honoured with the title of duchess of Kendal, countess of Glassenbury, and countess of Faversham. Kendal gave birth to Dr. Barnaby Potter bishop of Chester, Dr. Christopher Potter, provost of Queen's college, Oxford, and Dr. Thomas Shaw the traveller and principal of Edmund hall. A Map of the Lakes in Cumberland, Westmorland and Lancashire, now Cumbria, scale about 3.5 miles to 1 inch, engraved by Paas, 53 Holborn, London, included in the Guide to the Lakes by Thomas West, published by William Pennington, Kendal, Westmorland, and in London, from the 3rd edition 1784, to 1821. As well as buildings there is a castle to the east. The approach to it from the north is pleasant. A noble river, the Kent, is discovered flowing briskly through fertile fields, and visiting the town in its whole length. It is crossed by a handsome bridge, where three great roads coincide, from Sedbergh, Kirkby-Stephen, and Penrith. The main street leading from the bridge slopes upwards to the centre of the town, and contracts itself into an inconvenient passage,  where it joins another principal street, which falls with a gentle declivity both ways, and is a mile in length, and of spacious breadth. Was an area for a market-place opened at the incidence of these two streets, it would be a noble improvement. The entrance from the south is by another bridge, which makes a short awkward turn into the suburbs, but after that, the street opens well, and the town has a chearful appearance. The principal inns are genteel, commodious, and plentifully served. Here is a workhouse for the poor, which for neatness and oeconomy exceeds most of the kind in the kingdom. This passage is now widened; and a new street has been opened from near the centre of the town, to the river side, which has much improved the road through it for carriages. The objects most worthy of notice here are the manufactories. The chief of these are of Kendal cottons (a coarse woollen cloth) of linseys, toilonets, kerseymeres, callicoes, and of knit worsted stockings. Also a considerable tannery is carried on in this town. The less (sic) manufactures are, of fish hooks, of waste silk (which is received from London, and after scouring, combing, and spinning, is returned) of ivory combs, and of wool cards, in which branch considerable improvements have been made by the curious machines invented here for that purpose. There are other articles of industry well worth seeing; as the mills for scouring, fulling, and frizing cloth, for cutting and rasping dying wood, &c. But what is most to the credit of this place, is, that notwithstanding many inconveniences, which this town has laboured under, the manufactures have all along continued to flourish, and have of late years been greatly increased by the spirit and industry of the inhabitants. These manufactures are particularly noticed so early as the reign of King Richard II, and Henry IV. when special laws were enacted for the better regulation of Kendal-cloths, &c.
When William the Conqueror gave the barony of Kendal to Ivo de Taillebois, the inhabitants of the town were villain-tenants of the baronial lord; but one of his successors emancipated them, and confirmed their burgages to them, by charter. Queen Elizabeth, in the 18th year of her reign, erected it into a corporation, by the name of aldermen and burgesses; and afterwards King Charles I. incorporated it with a mayor, 12 aldermen, and 20 capital burgesses. A TABLE OF THE Height of Mountains and Lakes SEEN IN THIS TOUR, ... TAKEN FROM THE LEVEL OF THE SEA. ... by Mr. John Dalton. ... the dusk of the evening coming on, I entered Kendal almost in the dark, and could distinguish only a shadow of the castle on a hill, and tenter grounds spread far and wide round the town, which I mistook for houses. My inn promised sadly, having two wooden galleries, like Scotland, in front of it: it was indeed an ill-contrived house, but kept by civil, sensible people; so I stayed two nights with them, and fared and slept very comfortably. or embattlements are demolished; ... There is a good view of the town and river, with a fertile open valley, though which it winds. blocks, on road, street plan, town, market, small plain cross for a charity school? Kendal is large and populous, and has twelve Chappels of Ease to its single Church. Here are seven incorporated Companies, and a noble Free School. A little Fray happen'd here last Year between ye Rebels, in their advance Southward, and some of the Inhabitants. Maps, Westmorland, scale about 8 miles to 1 inch, and Cumberland? in The Agreeable Historian by Samuel Simpson, printed by R Walker, Fleet Lane, London, 1746. Building; labelled as a town. Trinity Monday, April 25, October 28, and between them a great Beast-market every Fortnight. There are seven trading Companies belonging to the Town, viz. Mercers, Sheermen, Cordwainers, Tanners, Glovers, Taylors, and Pewterers, who have each their Hall. The Church here is beautiful, and very large, and yet has twelve Chapels of Ease belonging to it. 'Tis supported by five Rows of handsome Pillars. Near the Church is Free-School well endowed, with Exhibitions for such Scholars as are sent hence to Queen's-College, Oxford. There's a Charity-School here for sixteen Boys and ten Girls, all cloathed and taught. At a little Distance from the wooden Bridge are the Ruins of a Castle, in which Catherine Parr, the sixth Wife of Henry VIII. was born. This Place has had the great honour of giving Title of Baron, Earl and Duke, particularly that of Earl to Prince George of Denmark; and last of all, that of Dutchess to the late Melusina Schulenberg, who had before been created Dutchess of Munster in Ireland. A Map of Westmorland North from London, scale about 10 miles to 1 inch, and descriptive text, Cumberland similarly, by Thomas Badeslade, London, engraved and published by William Henry Toms, Union Court, Holborn, London, 1742. Kirby in Kendale is the largest Town in the County, Market Saturday, Fairs Monday before Lady-day, and Trinity Monday. Road book, Britannia Depicta Or Ogilby Improv'd, including road strip maps with sections in Westmorland, scale about 2 miles to 1 inch, derived from maps by Ogilby, 1675, and a county map of Westmorland, scale about 8 miles to 1 inch, with text by John Owen, published by Emanuel Bowen, London, 1720; published 1720-64. Kendal at 257 So called from its scituation on Kan or Kant Flu. Is a large Town, well built & populous, driving a Considerable Trade in the Woollen Manufacture. It had formerly a strong Castle, the Walls of which are partly yet standing, & has now a large Church & about 12 Chappels of ease. It was made a Corporation by Q. Eliz. 18[ ]. Regni & afterwards by K. James 1st. Regni, consisting of a Mayor, 12 Ald~, 12 Com~on Councilmen, a Recorder, &c. Here is a good Freeschool well endowed with Exhibitions to Queens Coll. Oxon. Mt. Sat. Fairs Au. 25th. & Oct. 28. & between the said Fairs a great Mt. for Cattle once a Fortnight. An alternative engraving of the descriptive text appears on this plate. Travel book, manuscript record of Journeys through England including parts of the Lake District, by Celia Fiennes, 1698. Kendall is a town built all of stone, one very broad streete in which is the market Crosse; its a goode tradeing town mostly famed for the cottons; Kendall Cotton is used for blanckets and the Scotts use them for their plodds and there is much made here and also linsiwoolseys and a great deale of leather tann'd here and all sorts of commodityes twice a week is the market furnished with all sorts of things. The River Can which gives name to the town is pretty large but full of rocks and stones that makes shelves and falls in the water, ... there are great falls of water partly naturall and added to by putting more stones in manner of wyers at which they catch salmon ... the roareing of the water at these places sometymes does foretell wet weather, they do observe when the water roares most in the fall on the northside it will be faire, if on the southside of the town it will be wet; some of them are falls as high as a house ... there are 3 or 4 good houses in the town, the rest are like good traders houses very neate and tight, the streets are all pitch'd which is extreame easy to be repair'd for the whole country is like one entire rock or pitching almost all the roads. At the Kings Arms one Mrs. Rowlandson she does pott up the charr fish the best of any in the country, I was curious to have some and so bespoke some of her [potted char], ... abundance of horses I see all about Kendall streetes with their burdens. Map, Westmorland, now Cumbria, scale about 8 miles to 1 inch, by John Seller, 1694; editions to 1787. Map, Ancien Royaume de Northumberland aujourdhuy Provinces de Nort, ie the Ancient Kingdom of Northumberland or the Northern Provinces, scale about miles to 1 inch, by Nicholas Sanson, Paris, France, 1679.
town plan, castle, river; Ogilby's route leaves at the end of Stricklandgate. town plan; Ogilby's route apparently goes round, not through the town, and keeps east of the river. Map, Cumbria et Westmoria, or Cumberland and Westmorland, scale about 3.5 miles to 1 inch, by John Jansson, Amsterdam, Netherlands, 1646; published 1646-1724. Buildings and towers, suggestion of a wall, notice ?fence palings; upright lowercase text; market town. Table of distances and map, Westmerland ie Westmorland, now Cumbria, scale about 16 miles to 1 inch, by Thomas Jenner, London, 1643. Poem, Drunken Barnaby's Four Journey to the North of England, by Richard Brathwaite, 1638, published 1716-62. I drank Ale both thick and clammy. Where I had my Native Breeding. [footnote] A Town so highly renown'd for her commodius Cloathing, and industrious Trading, as her Name is become famus in that kind. Camb. in Brit. Sing, nor care they much who know it. Table of distances and map of Westmorland, engraved by Jacob van Langeren, published by Mathew Simons, London, 1635-36. Poem, Polyolbion, by Michael Drayton, published 1612, part 2 with Cumbria published by John Marriott, John Grismand, and Thomas Dewe, London, 1622. Map, Cumberlande and Westmorlande, by Michael Drayton in part 2 of Polyolbion, probably engraved by William Hole; published by John Marriott, John Grismand, and Thomas Dewe, London, 1622. Maps, The Countie Westmorland and Kendale the Cheif Towne, scale about 3.5 miles to 1 inch, and Cumberland and the Ancient Citie Carlile, scale about 4 miles to 1 inch, by John Speed, London, 1611; published 1611-1770. Map, Westmorlandia et Comberlandia, ie Westmorland and Cumberland now Cumbria, scale about 16 miles to 1 inch, probably by Pieter van den Keere, or Peter Keer, about 1605; published about 1605 to 1676. ... the principall profit that the people of this Province [Westmorland] raise unto themselves, is by cloathing. Map, Angliae Regni, Kingdom of England, with Wales, scale about 24 miles to 1 inch, authored by Humphrey Lloyd, Denbigh, Clwyd, drawn and engraved by Abraham Ortelius, Netherlands, 1573. Book, Cronycle of Yeres, including an early table of highways, published by Wyllyam Myddylton, at the sign of the George, Fleet Street, London, 1544. Reproduction of the Gough Map of Great Britain, reduced size, published by the Ordnance Survey, Southampton, Hampshire, 1875; and a full size line reproduction, with added transcriptions of placenames, 1935. Buildings and towers, symbol for a town. Road book, British High Roads, published in four parts by Tinsley Brothers, 8 Catherine Street, Strand, London, 1877. Itinerary, route 7, London to Whitehaven via the Lake Districts, including from Settle, Lancashire; through Kirkby Lonsdale, Kendal, Ambleside, Westmorland; then Keswick, Cockermouth to Whitehaven, Cumberland, published by Tinsley Bros, 8 Catherine Street, Strand, London, 1877.
pp.71-91 in British High Roads, North and North Eastern Routes; pp.84-91. Strip map, road map, part of London to Whitehaven, including from before Kirkby Lonsdale through Kendal, Windermere to beyond Ambleside, Westmorland, published by Tinsley Bros, 8 Catherine Street, Strand, London, 1877. Map pp.77-78 in British High Roads, North and North Eastern Routes. Road book, illustrated itineraries, Roads Made Easy by Picture and Pen, vol.3, by Claude Johnson, edited by Lord Montagu, published by The Car Illustrated, 168 Piccadilly, London, 1908. Itinerary, Route 37 in Roads Made Easy by Picture and Pen, Preston to Glasgow, by Claude Johnson, edited by Lord Montagu, published by The Car Illustrated, 168 Piccadilly, London, 1908.
pp.1-10 in the road book, Roads Made Easy by Picture and Pen, vol.3. Itinerary, Route 37 reverse in Roads Made Easy by Picture and Pen, Glasgow to Preston, by Claude Johnson, edited by Lord Montagu, published by The Car Illustrated, 168 Piccadilly, London, 1908.
pp.11-21 in the road book, Roads Made Easy by Picture and Pen, vol.3. ROUTE 37. Reverse / GLASGOW via Hamilton (11 1/2), Abington (37 1/2), Beattock (56 1/4), Lockerbie (70 1/2), Carlisle (95), Penrith (113), Shap (123 1/2), Kendal (139 1/2), Lancaster (160 1/2) to PRESTON (182). Itinerary, Route 39 reverse in Roads Made Easy by Picture and Pen, Glasgow to Doncaster, through Skipton, by Claude Johnson, edited by Lord Montagu, published by The Car Illustrated, 168 Piccadilly, London, 1908.
pp.57-65 in the road book, Roads Made Easy by Picture and Pen, vol.3. ROUTE 39. Reverse. / GLASGOW via Carlisle (95), Kendal (139 1/2), Kirkby Lonsdale (151 1/2), Ingleton (157 1/4), Hellifield (175), Skipton (184 1/2), Ilkley (193 1/2), Otley (199 1/2), Junction with North Road (214 1/2) to DONCASTER (244 1/34). Itinerary, Route 42 in Roads Made Easy by Picture and Pen, Kendal to Carlisle, through The Lakes, by Claude Johnson, edited by Lord Montagu, published by The Car Illustrated, 168 Piccadilly, London, 1908.
pp.85-88 in the road book, Roads Made Easy by Picture and Pen, vol.3. ROUTE 42. / KENDAL via the Lakes, Windermere (8 1/4), Grasmere (17), Dunmail Raise (20 1/4), Thirlmere, Keswick (30), Bothel (42 3/4), to CARLISLE (61 1/4). ... and to Kendal at 256'1 extending 1M. on the Road. Kendal, a fair, large T. pleasantly seated on Can or Kent flv. is of no great Antiquity, but noted for its Manufactures of Cotton, Druggets, Hats, Stockings, &c. It has a large Ch. with 12 Chaps. of Ease, and on the E. of the Riv. formerly stood a Castle, of which the ruinous Walls now only remain: 'Tis govern'd by a Mayor, 12 Mayor-Peers or Aldermen, 12 Common-Council-Men, a Recorder, &c. Near the Ch. is a Free-School well-endowed, with Exhibitions to Queen's-College in Oxford: Here, is kept a great Mt. on Saturd. with 2 Fairs, viz. on April 25. Octob. 28. and between those Terms, a great Beast-Mt. every Fortnight. The map is probably a reproduction, possibly a fake. Reproduction map, uncoloured lithograph, Plan of Kirkby Kendall ie Kendal, Westmorland, scale about 10 inches to 1 mile, perhaps from a coloured original of the late 17th century; perhaps a fake. Saturday market granted by Richard I, 1189; Britnell and Hatcher 1996. Saturday market to be held at the manor, granted by Edward II to Marmaduke de Tweng and William de Ros, 28 August 1309; listed in the Calendar of Charter Rolls. Letters patent for a market at Kirkeby in Kendale or Kirkby in Kendal, 7 Ed 3, 1333-34, and 52 Hen 3, 1267-68, in Palmer's Index No.93 at the Public Record Office. Market day Saturday given on Bowen and Kitchin's map, 1760. Guide book, Pearson's Gossipy Guide to the English Lakes and Neighbouring Districts, published by C Arthur Pearson, Henrietta Street, London, 1900s. Print, halftone photograph, A Side Street in Kendal, Westmorland, published by C Arthur Pearson, Henrietta Street, London, 1900s. On p.51 of Pearson's Gossipy Guide to the English Lakes and Neighbouring Districts. A SIDE STREET IN KENDAL. (p.52). Engravings - Westmorland, Cumberland, Durham and Northumberland Illustrated; from drawings by Thomas Allom, George Pickering, and H Gastineau, described by Thomas Rose, published by H Fisher, R Fisher, and P Jackson, Newgate Street, London, 1832-35. Print, uncoloured engraving, Kendal, from the Castle, Westmorland, drawn by Thomas Allom, engraved by W le Petit, published by Fisher, Son and Co, London, 1832-35.
vol.1 pl.22 in the set of prints, Westmorland, Cumberland, Durham and Northumberland Illustrated. T. Allom. / W. Le Petit. / KENDAL, FROM THE CASTLE. / FISHER, SON & CO. LONDON, 1832. Print, engraving, Kendal, Westmorland, published by John Johnstone, Paternoster Row, London, et al, 1847. On p.18 of Sylvan's Pictorial Guide to the English Lakes. Print, uncoloured engraving, charter seal, Kendal, of Charles I, published by Hudson and Nicholson, Kendal, Westmorland, 1832. On p.147 of The Annals of Kendal by Cornelius Nicholson. Print, uncoloured engraving, corporation seal, Kendal, published by Hudson and Nicholson, Kendal, Westmorland, 1832. On p.144 of The Annals of Kendal by Cornelius Nicholson. Book, Sayer's History of Westmorland, published by W Sayer, Kendal, Westmorland, and Partridge and Oakey, 34 Paternoster Row, London, 1847. Frontispiece to vol.1 of Sayer's History of Westmorland, drawn by Thomas Gilks. courtesy of the antique shop in Sedbergh. hearsay Kendal Parish Records include records of payments of a bounty on polecats in the 18th century; 51 in 1702, 173 in 1794, and similar numbers in the years between. The polecat was known as the foul mart. hearsay Archers from Kendal, Kendal Bowmen, did well at the Battle of Flodden, 1513. Their uniform was green, Kendal Green, and buff, with arrow buttons. hearsay Kendal Green was cloth dyed yellow using dyer's greenweed, Genista tinctoria, the dyed again probably with woad, Isatis tinctoria, or, later, indigo. hearsay In Stricklandgate there is a black boar shop sign, at Black Hall, formerly a brush works. The sign is a fake, the original is in the Museum of Lakeland Life. map 'Organ factory' labelled at SD51799228. 'The Calling Stone' labelled at SD51489263 outside the town hall.